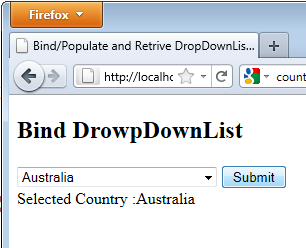 In this article I will show you how you can bind/populate dropdownlist using entityframework in asp.net mvc using C#. In this article I will also show you after binding how you can retrieve the selected value of dropdownlist at controller end. This article you can use in MVC2/MVC3/MVC4/MVC5 application. Some of my previous articles are as follows: Error : SQL Server Compact is not intended for ASP.NET development., Integrate and Retrive HTML Textbox Editor Value In Asp.Net MVC Using C#.Net, File Upload in MVC3 By Using Razor, Restrict Number of Characters to be Entered in the TextArea Using jQuery in Asp.Net MVC, Multiple File Upload With Asp.Net MVC C# and HTML5 | How to upload files to ASP.NET MVC application. Now for this article first we will create a new mvc application. After creating application we will create model. In our model file we will add the below code. 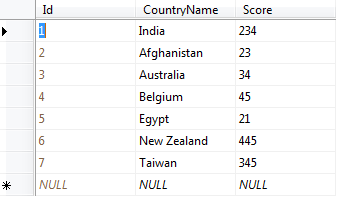 Now just check the Entity Framework and sql table. Now again come to solution explorer and add the controller class file. 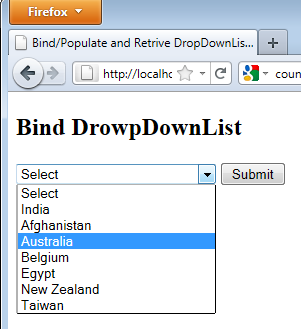 In your controller add the below code to bind the dropdownlist. Now we will create View for the model. In this view we will add all the HTML tags. In above code we have first accessed the model. This model we will use to bind with the control. Now we have done run the page and see the output. Now we will learn how we can retrieve the selected value at controller end. For this you needed to create post method in the controller. Now add the below post method in your controller. In above code you will see the index method parameter name is same as the dropdownlist in our view. You need to keep both name same other wise you will not be able to get the selected value. 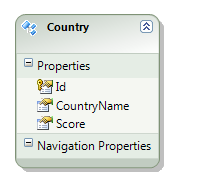 Now click on submit button you will see the selected country value in parameter. Now press F5 and check the final output. IS this a Model? Do we need to create a Model named CountryListModel? Exactly the question I have! Could anyone please shed light on this?